Sixty-six percent of marketers say they expect their organization’s content marketing budget to increase in the next 12 months. Eighty-eight percent say they will produce more content in 2016 than they did in 2015. They are using more tactics in general (13 this year, compared to 12 last year), and usage of most tactics has increased year-over-year. Their usage of the top social media platforms (LinkedIn, Twitter, YouTube, Facebook, and Google Plus) has increased. However, their effectiveness has dipped substantially from last year: 34% consider their organizations to be effective at content marketing this year, compared to 42% last year. What is going on? Are UK marketers doing too much? Is it time for them to step back, get focused, and consider whether they have a strong foundation for meeting their content marketing goals? That’s what our research team wondered as we pored over the data from our annual content marketing survey, reported today in Content Marketing in the UK 2016: Benchmarks, Budgets, and Trends, sponsored by Lionbridge. Below is our analysis of this year’s results with some suggestions on what improvements UK marketers can make. Wait … where’s the strategy? Where’s the mission statement? One reason for the lack of effectiveness could be the lack of a road map. Only 37% have a documented content marketing strategy (versus 36% last year) and even fewer (32%) have a documented editorial mission statement. 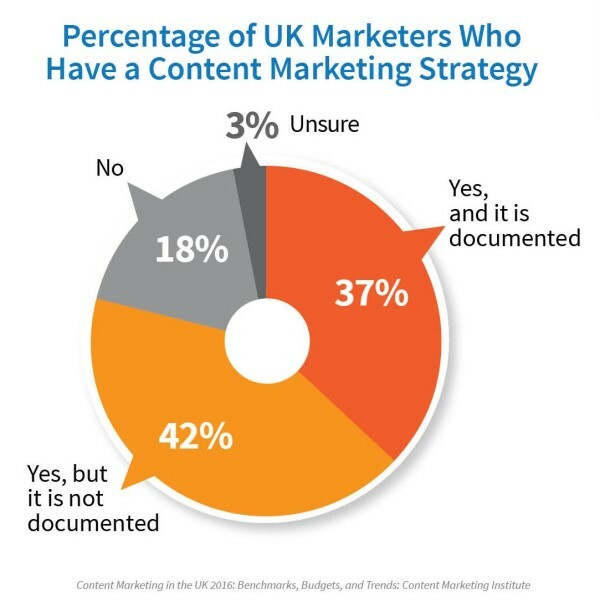 What UK marketers should do: Documenting the content marketing strategy and editorial mission statement are key differentiators between effective marketers and their less effective peers that we consistently see across all of our research. Without a stated plan – that can be shared across the entire team – it simply does not make sense to spend and produce more content. Missed opportunities to build an audience? 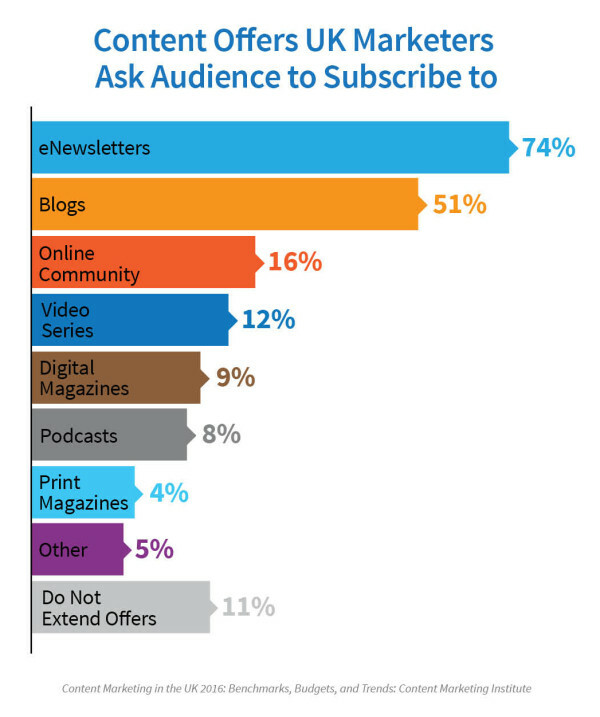 Furthermore, while nearly three out of four UK marketers ask their audience to subscribe to an e-newsletter – and around half ask their audience to subscribe to a blog – the content offers pretty much stop there. What UK marketers should do: I can’t stress how important it is for UK marketers to use content to build an audience, as this not only helps you get data around your prospects and customers so you can better serve them, but it also opens up opportunities for monetization. Remember: Building subscribers is different than generating leads. While there are several ways to get subscribers (video, print, podcasts, followers via social channels), email subscribers are often the best approach, as you have the most control over them. Are you just creating content? It wasn’t that surprising to us that UK marketers said producing engaging content was their biggest content marketing challenge and the biggest priority for their internal content creators over the next year. Producing engaging content is a perennial challenge for all content marketers, no matter where they’re based. What was interesting is that the UK marketers who said their firms are most effective at content marketing said measuring content effectiveness is their biggest challenge (rather than creating engaging content). This group’s top priority? Developing a better understanding of what content is effective – and what isn’t. What UK marketers should do: The most effective UK marketers have it right: Figuring out what’s working is exactly what you should do. Not only do you want to be able to double down on what’s working, but you also want to assess your efforts to decide what not to do. Stopping less effective activities is truly essential if you want to have time to focus on what works. Make no mistake: Content marketing is alive and healthy in the United Kingdom. By doing some foundational work and making a few course adjustments, many firms will find themselves taking their content marketing to the next level in 2016. In the meantime, we’d love to hear from you. If you’re highly effective at content marketing, tell us why. If you have room to improve, let us know what adjustments you’re planning to make. What help do you need? 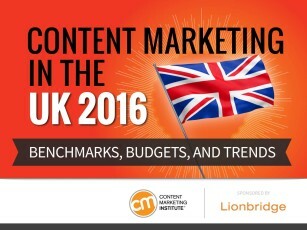 To read all the results from the UK marketing research, download Content Marketing in the UK 2016: Benchmarks, Budgets, and Trends produced by Content Marketing Institute and sponsored by Lionbridge. 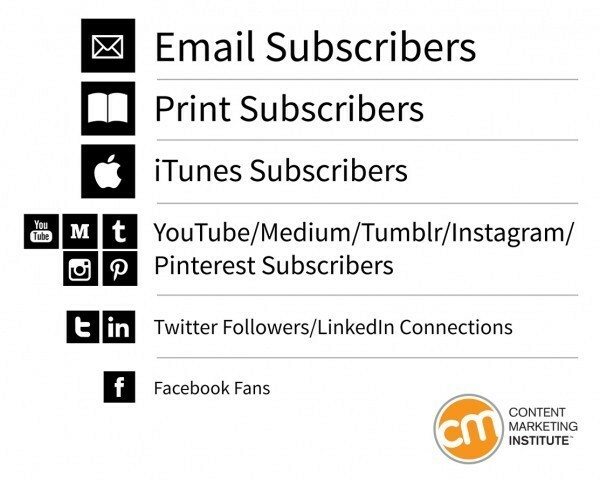 To learn more about how to improve your content marketing, subscribe to CMI’s blog posts.